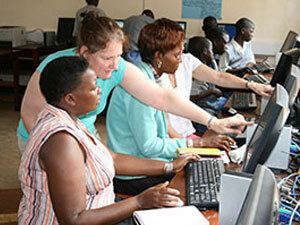 More than 1,200 people have visited Kabubbu with the Quicken Trust so far. 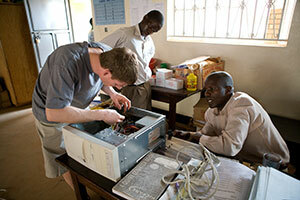 Quicken is a Christian charity and many who come are from a faith background. But many are not. All are equally welcome. 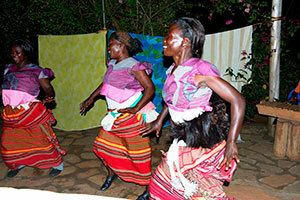 Some have come with skills to pass on in areas such as music or handicrafts. Many others have tried their hands at new tasks such as helping children with reading, collecting the life stories of elderly villagers or mixing cement for house building. But everyone has come with a willingness to muck in, bags of enthusiasm and a heart to serve the people of Kabubbu. For many, it’s a life-changing experience. “We were given a brick (for helping to build a house) … it means so much more to me than any trophy or award I could win back in the UK” – William Parker School student. “It has completely changed my outlook on poverty – I now want to be pro-active rather than reactive.” – Gillian Ives. 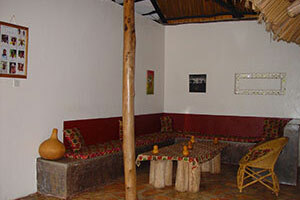 Accommodation and food is provided at the Kabubbu Resort Centre. You can hire a motorbike taxi – boda boda – for a tour around the village. It’s a fun way to get around. Watch: A ride from Community Primary School to village centre. Quicken will arrange all flights to and from Uganda at special low rates. Visitors and volunteers are asked to make a minimum donation which covers the cost of flights, transfers, food and accommodation and the introductory tour of the village. 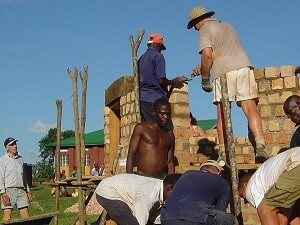 Volunteers and visitors are also asked to do some fundraising. Everyone is set a minimum sum – currently £500 per person in a volunteer group, or £600 per person as a visitor. 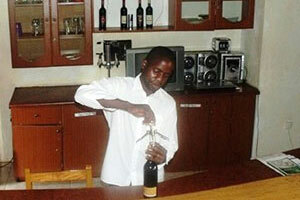 Before departure, you will be given a detailed itinerary setting out what you will be doing. You may have to do some preparatory work before setting off. You may also be asked to take extra packages in your luggage – such as medicines, books or Christmas presents for children in the village. Every visit starts with a tour of the village, where you will be shown the 14 projects in which Quicken is involved. Most volunteers and visitors will watch at least one assembly at the primary school – a joyous, exuberant event. (Video) Some may be asked to speak. Most days also include an education session where KDP representatives give a short briefing on various projects around the village such as welfare, the schools and agriculture. This innovation enables volunteers to come face-to-face with the issues facing a Kabubbu family juggling meagre resources – and encourages them to help find solutions. A team of volunteers is taken by the KDP Welfare team to meet a needy family. The volunteers ask questions to discover the family’s specific plight. The team then meets back at the Resort to discuss the best way to help. The Welfare team provides the volunteers with a small sum of money to implement their plan and help to transform the family’s circumstances. Buying beds, mattresses and mosquito nets or tools or livestock or renting land could dramatically change their lives. If you have adopted an elderly person, Quicken can arrange for you to meet them and their family too. You may want to take a gift to your child or granny – though it is best to discuss this with Quicken first. 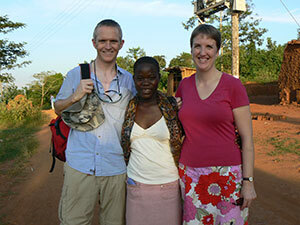 In July 2000 Gillian and Andrew Ives from Eastbourne, East Sussex began sponsoring Evelyne, an eight-year-old girl in Kabubbu. Ten years later – and with some trepidation – the Ives travelled to see her. 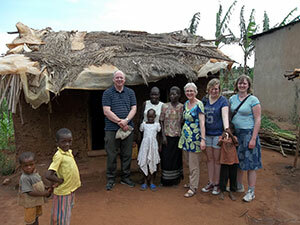 Quicken’s Development Director, Geraldine Booker, took them to the family home. Days in Kabubbu are busy – but the evenings are usually free. There’s time to relax in the bar area, have a drink, read or play games. There’s also a chance to sample local cuisine and enjoy some traditional music and dance from the White Angels group during the African Evening. 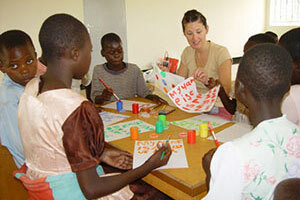 Visitors may also get the chance to learn a new skill such as basket-weaving, drumming or African dancing.